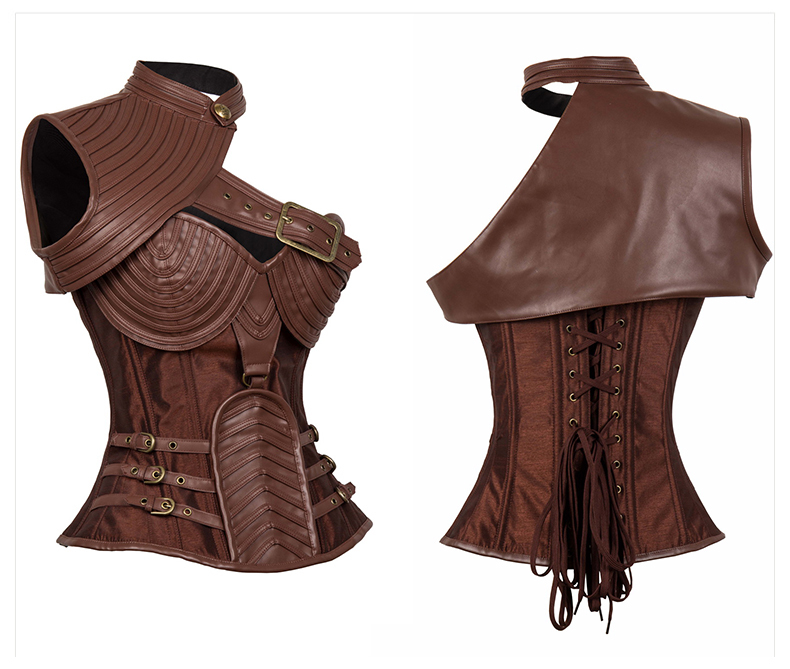 Steampunk overbust corset made by faux leather material, attached a high neck shrug with a button(Black & Brown) or a velcro(Black2 & Purple) and adjustable buckle trim, steel boned, two sides with buckles trim, zipper-up closure at side, lace-up at back for cinching, g-string not included.
. Please refer to the detail size chart before order. Manual measurement may exist 1-3cm difference.
. The real color of items may be slightly different from the pictures shown on caused by many factors, such as brightness of your monitor and light brightness.
. Any problems about the size, please do not hesitated to contact our SERVICE STAFF. Such a beautiful corset! Good quality, nice stitching, love it! Can really tighten it with the easy to handle small black rope in the back. Would definitely recommend this product. размер S оказался широк ниже талии (от 60, об 91), верх лифа топорщится, но с одетым оплечьем выглядит уже более приемлемо. качество пошива хорошее, никаких торчащих ниток или кривых швов нет.